The average wait time in a restaurant for a customer to wait for a meal is aproximately 20 minutes. Most of this time is spent looking at the table top. Give your guests something colorful and interesting to look at. You can coordinate your custom color paper placemats with our custom printed napkins and custom printed plates as well. Our paper place mats are eco-friendly and give you a flexible, cost effective way to update your menu, promote special offers or introduce new food items to your customers. With custom printed promotional placemats, you can promote to your customers without emptying your wallet! Choose one of many styles, perfect for any occasion. We offer paper placemats, dinner placemeats, luncheon placemats, and more! Perfect for bars, restaurants, weddings, meetings, proms, graduations or anywhere else, these custom advertisement placemats can add a professional look with a low price. Perfect for promoting at benfits, promotional events, restaurant table tops or tray inserts. We offer many types of Placemats. Perfect for bars, restaurants, weddings or anywhere else. These custom advertisement placemats can add a professional look with a low price. These Custom Printed Plates are made to your specifications. Paper Plates are perfect for advertising on a limited budget! 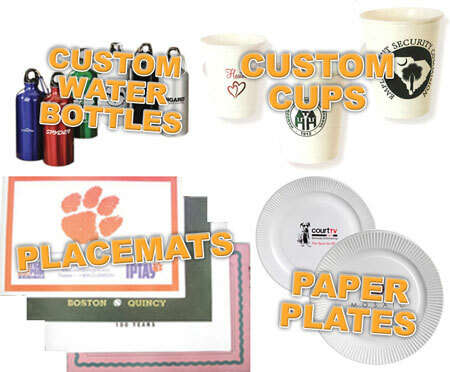 Choose from many styles of custom paper cups, water bottles, stadium cups and other drinkware. Personalized Cups are great for any occasions. With custom printed promotional napkins, you can promote to many without breaking your budget!